Submitting a Purchase Order with us is EASY! Note: Must already have an Authorized PO# from your school or district. *All Workbooks are available as Instant Downloads, preloaded on USB Flash Drives, and Paperback. *Shipping is $5.00 for the first item and $1.00 for each additional item. Downloads are free shipping. *Be sure to include the “Bill To” fax number as well as the “Ship To” Email Address on the order form. *Please make checks payable to Have Fun Teaching and send payment to the Vendor address below. *Upon receipt of your Purchase Order via Email or Fax, we will Email your Workbook Downloads to the Email Address or Mail the USB Flash Drives or Paperback Workbooks to the Shipping Address provided on the Purchase Order Form. 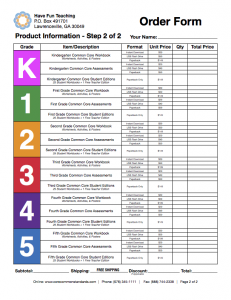 Each Teacher must purchase a separate Workbook Download, USB Flash Drive, or Paperback Workbook. You can not purchase 1 Workbook for an entire grade level or school. *If you are unhappy with any item for any reason, let us know within 30 days for a full refund. *Your satisfaction is our number one priority! *If you have questions or concerns about your order, simply call customer service at 1-678-345-1111 or Email Us at [email protected].